Triacetyl resveratrol is Resveratrol prodrug. Cambinol is a SIRT1 and SIRT2 inhibitor with IC50 values of 56 and 59 μM, respectively. OSS-128167, also known as SIRT6-IN-1, is a potent and selective SIRT 6 inhibitor. Sirtinol is a sirtuin inhibitor, with IC50s of 48 μM, 57.7 μM and 131 μM for ySir2, hSIRT2 and hSIRT2, respectively. Resveratrol is a phenolic phytoalexin found in grape skin and other plants. SRT 1720 is a selective activator of human SIRT1 with an EC1.5 of 0.16 μM, and shows less potent activities agaiinst SIRT2 and SIRT3 with EC1.5s of 37 μM and > 300 μM, respectively. AK-1 is a potent, specific and cell-permeable SIRT2 inhibitor. Salermide is an inhibitor of Sirt1 and Sirt2; can cause strong cancer-specific apoptotic cell death. 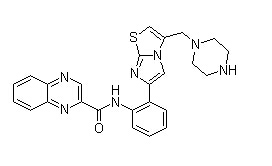 AGK2 is a selective SIRT2 inhibitor with IC50 of 3.5 μM.